Once we walked the shoreline and observed the culture, we needed food. Nothing burns calories like just existing in 100 degree heat. That statement may not be accurate, but in my mind it's irrefutable. Even after all that existing walking and eating, we still had a lot of time. Staying at a hostel means no going back to the room to relax. Staying at a hostel means a lot of things actually, but that' a conversation to have for later. The ride up the mountain. We took a cable car to the Pão de Açúcar, a tourist location that literally exists because of "why not?" It started as an actual tramline for supplies, and I suppose at some point, someone said "I bet people would pay money to just come up here and drink smoothies." That person was correct. We took a cable car up to a summit, where I drank a smoothie and otherwise stayed out of Angie's way. I mean I took pictures when she asked, but they were terrible and resulted in her just taking selfies anyway. So yeah, smoothies. Or taking advantage of the only available shade. The view from the highest level of the mountain was majestic, but (in my opinion) boring. The clouds and the distance seemed work together to seep out the color. It was pretty, but not one of my favorite scenes of the day. We went back to the hostel to shower get ready for the evening. Every morning when we woke up, we slathered ourselves in sunscreen and bug spray. We would then sweat right through all of it. It was a complete waste of a shower and at some point we realized it. We started showering after the sun set. It was still hot, but not as hot and without the sunscreen it was easier to feel clean. 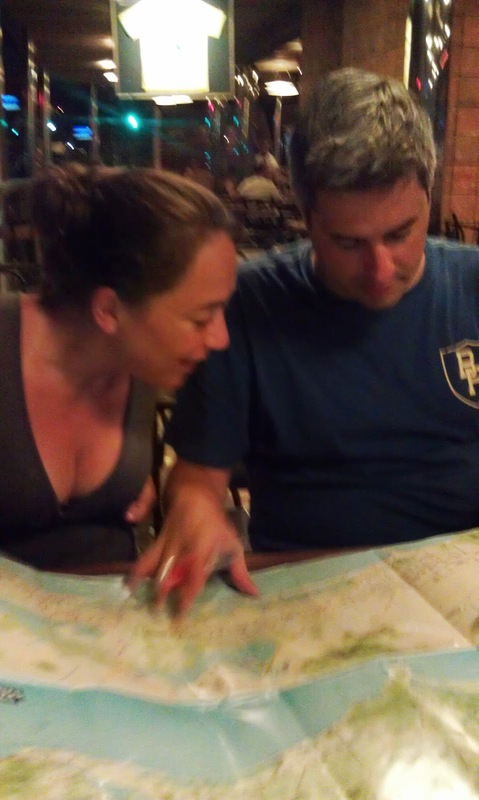 On the evening of our first full day in Rio de Janeiro, we got clean and went out to find dinner. We traveled about two blocks. There was an outdoor / indoor bar restaurant that was playing the 49ers / Packers game. It accepted credit cards and was therefore good enough for us. Stopping there ended up being a great idea - because we learned a crucial lesson: empadas and empanadas are not the same. 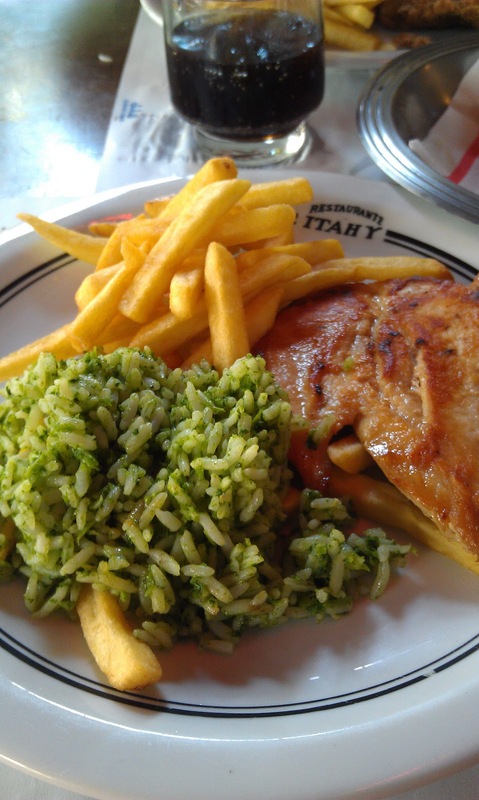 Having recently come from Argentina - where we had empanadas at every opportunity - we were thrilled to see them on the menu in Rio. We ordered them and we waited. Then we moved tables. Eventually our waiter brought us a... a thing. It was like a hot muffin. We were sure it wasn't ours. (We seriously convinced ourselves that the people who had been at the table had ordered it and left before it arrived. I blame the sun, even though it was down.) The hot muffin was filled with chicken, much like our empanadas were supposed to be. Ang deemed the muffin as "not bad," and we ate it while waiting for our food. It wasn't until the second muffin came that we took a closer look at a menu. Empadas are muffin like pastries filled with meat or veggies. Empanadas are croissant like pastries filled with meat or veggies. It's an important difference possibly connoted by the differences in spelling. Or maybe not. I don't know. Either way, empadas are tasty, but not as tasty as empanadas. If you prefer one, you'll be able to survive the other. But you won't be happy about it. We also met a group of Brazilian guys who spoke English. Trust me when I tell you that is significant. Not a lot of Brazilians speak English. I mean, I suppose they might. But if they do, they definitely don't like to admit it to native English speakers. The guys were old friends hanging out for the holiday break. One was Vin Diesel's stunt double in Fast Five, of the Fast & Furious movie franchise. One was engaged. One was married and lying to his wife about his whereabouts all night. We went those savory characters to see a Samba band at some random club. I met a few women who were determined to teach me to Samba. I think I walked away able to fake at an acceptable level. Still, the band was good and it was really cool to get that local perspective of the city. It would have only been better if I knew where exactly I was and didn't have to rely on strangers to communicate. 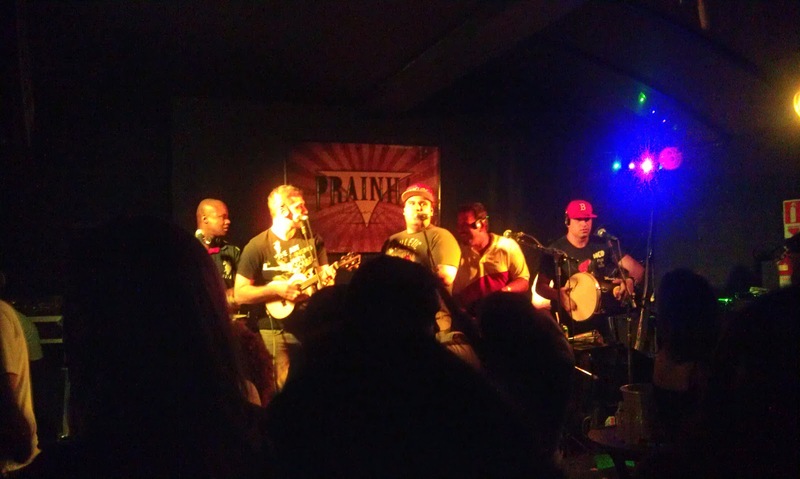 I'm not sure if Prainha is their name or the name of the venue. We did very little and it was super fulfilling! As it was our first business day in Rio, we set out to get some cash for me. Being sans debit card in Brazil was not nearly as bothersome as it was in Argentina. Most places accepted credit cards. So while I couldn't tip, I could buy. It was liberating. Still, one must have cash on hand for taxi rides and what not. And I was feeling confident in my Western Union abilities. We ate breakfast at the hostel (where it was provided) and set out to to one of many supposed Western Union locations. The first was in a mall and inside a currency exchange. The people there said "no." I can't tell you why, because I don't speak Portuguese. We went to a bank where an employee told me I was not allowed to pick up money because I was not a citizen. I showed him my Brazilian visa - which doesn't give me citizenship but does count as a state certified photo ID. He was not impressed. Actually, he was impressed. But I still did not get to withdraw the money I had sent to myself. Calling Western Union was the final nail in my financial coffin. I was advised to send the money to a Brazilian relative and have that relative pick it up for me. I mean, what's the purpose of having an international money transfer service if not all people can retrieve money in all places? Yes, I've learned my lesson. Even now, I constantly check for my debit card and I've added a pin to my travel card. But if something had happened to Angie - or if I had been traveling alone - I would have been stuck. Ang became my financier for the rest of the trip, like a mom. It was the simplest solution that we took the longest time to accept. A portion of a lunch order. There were more carbs ready to be served. Then we ate. Eating in a new country is always a somewhat scary experience. I think it's even worse for Ang. She's not exactly an adventurous eater. We went to an "Italian" restaurant that specialized in serving plates of proteins and carbs, with a side of more carbs. I want to tell you that I was able to rise above the temptation and eat salads, but I am not a liar. The combination of fries + rice brought me to a fat kid happy place. And I don't regret it. 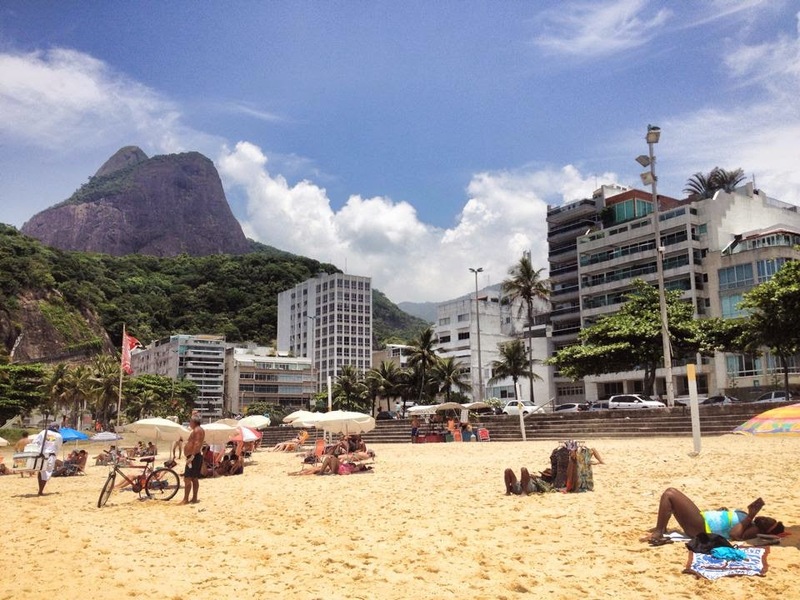 We walked the streets of Leblon, browsing and shopping. We spent a few hours on the beach, just allowing the time to pass. I read. Angie sat and splashed and sat and was able to otherwise quiet her restlessness for a remarkably long time. We were very close to living the dream. Living the dream, Danie style. That night, we took a cab to a different Italian place for dinner. We tried to go to a traditional Brazilian steakhouse, but our first choice was closed. Without the Internet or the ability to speak the language, we ended up at the first place that looked like we could have a delicious and relaxing time. It was neither awesome nor terrible. 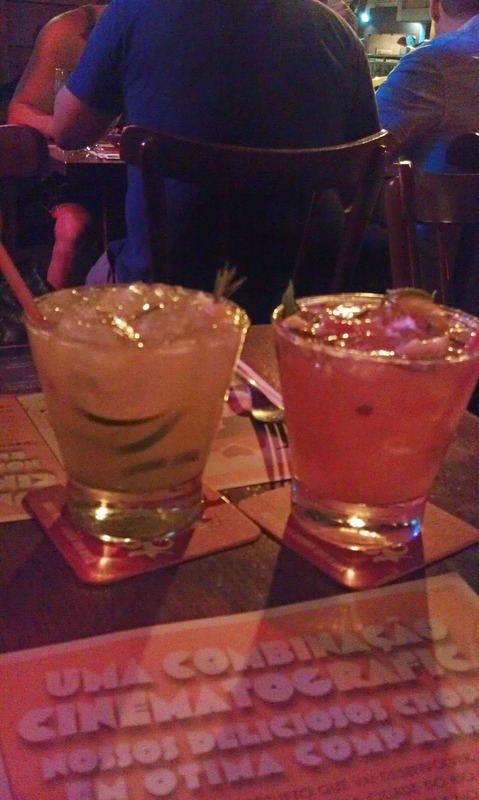 We sat on a covered patio, drank caipirinhas and cheered for a troupe of street performers. All in all, an excellent Monday night in Rio.